The final presenter, before lunch on the first day, was perhaps my favorite. Dr. Richard Warner (IAI) spoke on, ‘The Navan Temple, the Tech Midchúarta and Fiachna’s fatal round-house’. It will be argued that the very large ‘feasting-halls described in early, including ‘mythological’, Irish texts were describing real, contemporary Early Medieval buildings whose origin may be sought in the Iron Age, and typified by the 40-metre, wooden building excavated at Navan. it will be shown that archaeological evidence for large Early Medieval halls has been found but has been ignored or dismissed. As I said, I particularly enjoyed this speaker, as evidenced by the first note I made, “Look-up his scholarship!” He was not only a delightful speaker, but the material was fascinating. Listening to him, I wanted nothing more than to sit at a kitchen table, over a cup of tea, asking him a million questions. “Late literature (Ulster Cycle) does not give a glimpse of prehistoric life.” Or, does it? The Iron Age in Ireland is dated from ~300 BCE – 300 CE. It was during this time that ritual was held at Navan (95 BCE). Contrast this to the Ulster Cycle texts, which date to 800 CE. That leaves a 900 year gap between construction and use of the structure, and mention in literary sources. There was great state and rank and plenty in the king’s house at Emain. On this wise was that house—viz., the Red Branch of Conchobor, after the likeness of the House of the Midcourt.3 Nine beds were in it from the fire to the wall. Thirty feet was the height of each bronze front that was in the house. Carvings of red yew were therein. It was a board […] below, and a roof of tiles above. The bed of Conchobor was in the front of the house, with boards of silver, with pillars of bronze, with the glitter of gold on their head-pieces, and carbuncles in them, so that day and night were equally light in it, with its silver board above the king to the highest part of the royal house. Whenever Conchobor struck the board with a royal rod, all the men of Ulster were silent thereat. The twelve beds of the twelve chariot-chiefs were round about that bed. In fact, the description of feasting houses in the tales do not reflect the reality — in other words, there is no archeological evidence that ‘feasting’ houses matched the descriptions given in the literary tradition. An early medieval royal house was about 40 feet across. Detailed descriptions of daily life did not survive from the Iron Age to the Early Medieval period, but usages of form and function, particularly of royal ritual, did survive. We see lots of stories of houses burnt, and we also find descriptions of a king’s house. What is the due of a king who is always in residence at the head of his tuath? Seven score feet of perfect feet are the measure of his stockade on every side. Seven feet are the thickness of its earthwork, and twelve feet its depth. It is then that he is a king, when ramparts of vassalage surround him. What is the rampart of vassalage? Twelve feet are the breadth of its opening and its depth and its measure towards the stockade. Thirty feed are its measure outwardly. […] How is a king’s house arranged? The king’s guards on the south. Question–What guards are proper for a king to have? A man whom he has freed from the dungeon, the from gallows, from captivity, a man whom he has freed from service, from servile cottiership, from servile tenancy. He does not keep a man whom he has saved from single combat, lest he betray him, lest he slay him, in malice or for favour. What number of guards is proper for a king to have? Four, namely, a frontman and a henchman and two sidesmen, these are their names. It is these that are proper to be in the south side of a king’s house, to accompany him from house into field, from field into house. A man of pledge for vassals next these inwards. What is this man’s dignity? A man who has land of seven cumals, who presides over his (the king’s) chattels, including (those of) lord and base man and of the law of Féni. Next to him inward, envoys. Next to these, guest-companies. Poets next to these, harpers next. Flute-players, horn-players, jugglers, in the south-east. On the other side, in the north, a man at arms, a man of action, to guard the door, each of them having his spear in front of him always against confusion of the banquet-house [by attack from without]. Next to these inward, the free clients of the lord (i.e. of the king). These are the folk who are company to a king. Hostages next to these. The judge (the king’s assessor) next to these. His (the king’s) wife next to him. The king next. Forfeited hostages in fetters in the north-east. The king of a tuath (has a retinue) of twelve men (when he goes to the court of a superior king) to (protect) the interests of the tuath; whom the tuath itself sustains as regards their expense (?). Twelve men, too, are the retinue of a bishop for the interests of church and tuath in which he himself goes (on visitation). For a tuath cannot bear the retinue of king and bishop if they be always battening on it. The retinue of a master is twelve men. In this case, the inner ring of posts would have supported the roof. 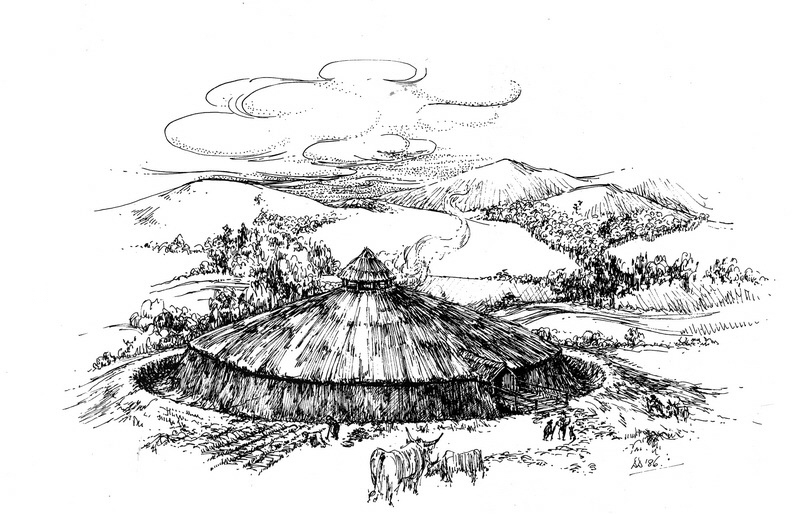 But the area between the outside of the `house’ and the inner face of the bank, instead of containing traces of sheds or pens, was found to contain concentric circles of large square wooden posts, centred on the centre of the ‘house’ (the hearth). Without going into detailed arguments, I will simply give it as the excavator’s conclusion, with which I fully agree, that these posts held a roof which completely covered the interior of the ringfort, its eaves being on the bank itself.14 Such a structure is otherwise unknown in a ringfort, The second, and main, ringfort at Lissue was, then, completely filled by a single huge building some 130 feet (40 metres) in diameter. The ‘house’ wall at the centre was simply a partition of some sort inside this structure, and around the hearth. The entrance to the central partitioned `hearth’ area led along a paved path through a six foot wide passage through the bank, to a gate in its outer face. Thence, unusually for a ringfort, it led across the ditch over a wooden bridge rather than the usual causeway, and out through another gate in a fence on the outer edge of the ditch. In the mid 1940s, the farmer remembered a gravelly `roadway’ leading away from this entrance, towards the east. 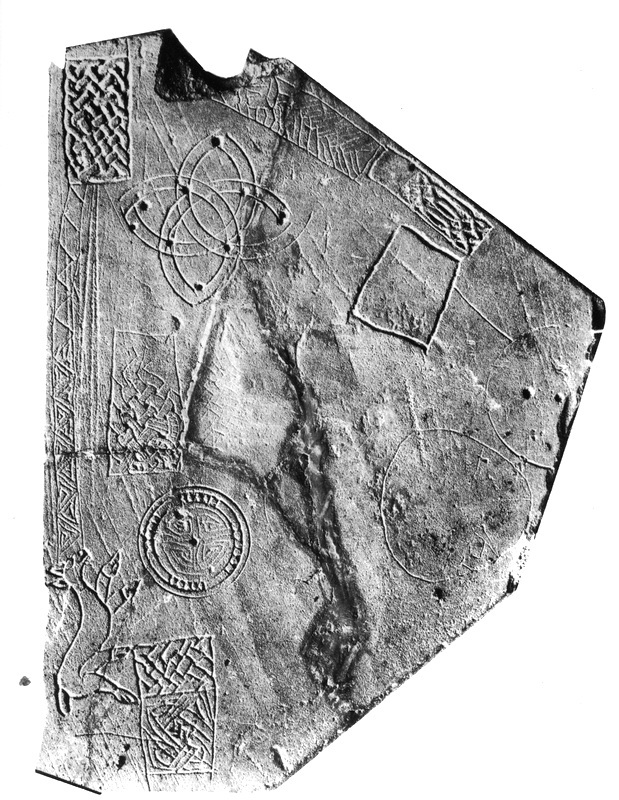 […] But the most spectacular find, from the last phase, was a slab of slate covered with carefully drawn incised sketches: an animal, bits of interlace, geometric patterns etc., (fig 3). It had on it the sort of patterns that could be found on contemporary metal ornaments, or in decorated gospel books, or perhaps even on peoples’ clothes. Decorated slates like this are called by archaeologists ‘trial’ pieces (or ‘motif’ pieces), but their real purpose is quite unknown. 16 This one was found in the layer of charcoal and burning that represented the demise of the site, a dramatic end in which a large proportion of the great structure was destroyed by fire. Usefully it can be approximately dated to about A.D. 1000 by the ornaments carved on it. This approximate date is supported by the other artefacts, to which a date around the 10th century would apply. It was Bersu’s belief that each wooden building would hardly have lasted more than 50 years in the Irish climate, then as now rather wet. This would give some 150 years for the maximum length of use of the three phases, and an earliest date in the middle of the 9th century for the first ringfort and the beginning of the second. These dates are, of worse, only approximate, but as we would hardly expect such a huge structure to be replaced sooner than was necessary, they seem reasonable. There was mention made to Clogher, Co. Tyrone, as another example of a royal feasting house. He used these examples to substantiate his claim that these descriptions of contemporary royal feasting houses do indeed reflect the reality of Emain Macha and is supported by archeological evidence. He speculated that the big ‘house’ (Navan Temple) was the tribes palace, not the actual house of the king, and an anti-chamber to the otherworld, which was ritually destroyed as a sacrifice so the Ulster warriors could use it in the otherworld.